Contact Jennifer Bourgeault at 207-391-6014 or collectivemotion.me@gmail.com to learn more about our themed birthday parties, or to book your celebration with us today! Studio rental for 2.5 hours and ½ hour prior to the party for decorating and food/beverage set up by the parent/guardian. The studio provides a dance instructor to teach a 45 minute dance class in the genre of your choice. We offer the following genres: ballet, jazz, hip hop, modern, contemporary, creative movement. We also can have a themed dance class such as fairy princess, musical theater, or inspiration from your child’s favorite TV show! The options are endless! The second hour and 45 minutes is the birthday celebration which is planned by the parent. You may bring in food/cake, open presents, etc. We have a large fridge/freezer to keep ice cream and food cold. We also have an oven should you need to keep any food warm. 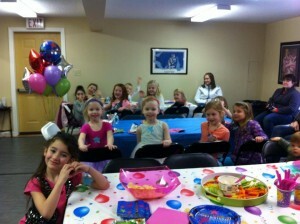 We also provide tables and chairs for your party! In addition, the studio provides post party clean up! Deposit: $50 non-refundable deposit is due at the time of the party reservation. Party reservation are made on first come, first serve basis. Reservation is not confirmed without a deposit. Balance is due day of party. Decorations: All birthday parties at the studio include a ½ hour prior to the party for decorating and food/beverage set up by the parent/guardian. All decorations must be hung up with tape and removed when the party is over. No nails, tacks or anything else that will damage the walls. Clean up: Please place all trash in the trash can provided for you by the studio and remove all decorations. We will dispose of the trash and a full clean up is provided by the studio. Footwear: We ask that you note on your invitations to have your guests bring their own dance shoes. If you do not have dance shoes you can wear any type of sneakers that are not worn in directly from the outside. We recommend bare feet or socks. Be safe: Please remind your party that students are not to touch or lean on the mirrors, hang on the ballet barres, or jump/stand on the furniture. Click here for more information and to download our Birthday Form!